As the name suggest the Adventure is the ideal buoyancy aid for adventure on the water. 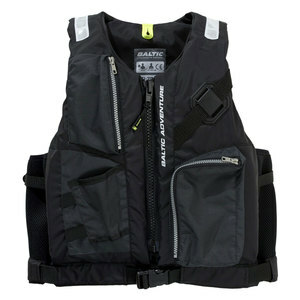 If you are fishing, paddling or just looking for a vest with multiple pockets Adventure is an excellent choice. There are two front zip pockets, a large one to use for example a bait box and a smaller one for a mobile phone. The Adventure also has several attachment points, a holder for pliers or multi-tool and retro reflective patches on the shoulders. The back has also two drain mesh pockets.